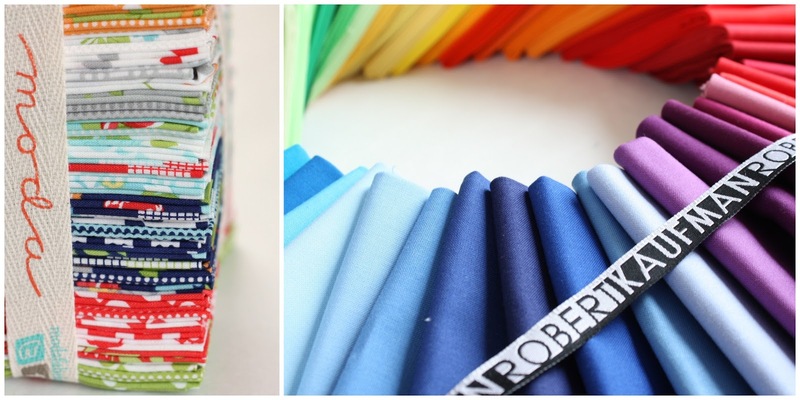 This week for Part 2 of our Virtual Quilting Bee, we’re going to talk about choosing fabric. If you’re wondering what in the world the Virtual Quilting Bee is, go to here for all the information and links to back posts. As is the case with Part 1 of this Quilting Bee, I’ve written an in-depth post about Choosing Fabric as part of the Beginning Quilting Series. And rather than rehash the whole thing in this post, I’m going to touch briefly on some of the concepts, but refer you there for more depth. Jeni Baker has also written a phenomenal and much more in-depth whole series about choosing fabric called the Art of Choosing. Everything from color to organizing and building a stash. It’s excellent and contains much more detail. I highly recommend it. Now that you have those places to go as great references, I’ll talk a little about my own process of choosing fabrics for a quilt – specifically a sampler quilt like we’re making as part of this quilt along. I’ll show some examples from my last sampler quilt. If we had to boil it down, there are two main things to remember when choosing fabric: Color and Scale. This is one of my favorite parts of creating a quilt. I love playing with color – which is probably why I’m always wanting to make something new: so I can play with new colors. I know for some people this can be tricky. Jeni’s series has some great suggestions for choosing color. Find a focus fabric and choose your color scheme based on that fabric. When making a baby quilt for my sister a few years ago, she really liked this jungle print by Alexander Henry, so we used that as the jumping off point for the rest of the fabrics. We pulled fat quarters off the shelves of a local quilt shop just based on the colors of the focus fabric. If you look at the finished quilt, notice that the colors aren’t all the exact same shade of green, brown, etc. We used different shades, but stayed with the same tone (as in olive greens, warm browns, etc). For example: even though we’re using green, it would have looked off to throw in a cool, mint green. I try to keep my colors the same vibrancy, such as warm or cool colors. Really clear, bright hues or dusty, muted hues. But sometimes I’ll break the rules. Last summer I made my daughter a purple quilt for her birthday. I don’t have a lot of purple in my stash so I cut up whatever purples I had -be they cool or warm shades – and threw them into the same quilt. And I’m happy with how it turned out. The different shades can give a lot of visual interest. A few other colors – in this case a sprinkling of pale orange, pink, and green – add a little more interest to a mostly monochromatic color scheme. If you really feel stumped, go with a pre-made collection from one of the quilting manufacturers. Most collections are purposely created with a cohesive color scheme and a variety of prints in different sizes and scales. That’s why they do that! And if you want to experiment along the way, pull in a few prints from other collections (new of from your stash) in the colors of the collection you are using. Lots of shops – both brick and mortar or online – will also carry pre-bundled groups of fabric. Watch for those as well if you want a kick-start. Don’t be afraid to ask for opinions/help. Any independent quilt shop worth it’s salt, will have helpful staff who can help you in your selection. You could also ask for opinions from a local quilt guild or trusted friend. Having a real live person who can look at your choices and give feed back is so helpful. Occasionally I have people email me for help with choosing fabrics, and it’s so hard to do over the internet. I always suggest doing it with a real live person so you can try out different combinations and edit together. When asking for help, give them a place to start. I know from working in a quilt shop how overwhelming it felt when someone would walk in and say, “I want to make this quilt, but don’t know what fabric to use…” I had no idea what their color or style preferences were. When that happened I would always say, “Walk around the shop and pick out 2 or 3 bolts that ‘speak to you’ and then I’ll help you choose fabrics that would go with them,” just to give me a sense of their preferences. For a quilt to look balanced and interesting (note I didn’t say perfect) a variety of scales (sizes) of prints can make a big difference. For the quilt above I really wanted to use some of those big Ann Kelle novelty prints, but I needed to off-set them with smaller dots and ginghams so that the big prints would stand out and not look too frenetic overall. Another way to break up busy prints is by using a solid. This quilt made from prints in Amy Butler’s Soul Blossom’s collection is an example where even just some white sashing breaks up the large scale colors and prints of the collection so that you can see the individual prints. I personally like to use solids as a contrast with prints to help them pop. (I recently did it here .) Frequently I’ll use one solid color (like here) to show off the fabrics, but you could also use multiple shades of a solid for visual interest as I did in the Christmas quilt above. Even when creating your blocks, I like to use high-contrast colors and different scales of prints to create interest. These blocks were all made for the last sampler quilt. When I was working on the blocks for this Block of the Month project, I choose my colors and prints and kept them together in one place so that I could pull from them to make a quick block. As we begin this quilt-along you may want to gather your fabrics together into one box or shelf so that you can play with combinations of colors and prints as you make each block. Final thoughts on choosing fabric in general: Don’t let it stress you out. Yes, it takes practice, but just go for it. The more you try, the more you will like what you do. Have faith in yourself. Now, here’s the tricky part of this project. The blocks in this sampler quilt are being created by 16 different people over the next 8 months. I have no idea what they’re going to look like, so this is going to be a little bit of a mystery quilt! All I know is that they’re going to create an 8″ block. I’m sending them a little bit of fabric to use so that there will be some cohesive look, but I’ve also told them they can use their stash for this project so they may pull in fabrics that aren’t part of the collection. So even if you order a fabric bundle of Happy Go Lucky or Kona Solids to use for this project, be forewarned that there may be a few prints or solids in these blocks that are not part of your ‘kit’. Don’t let that stress you out! Use that opportunity to stretch yourself – maybe even get outside your comfort zone – and pull something from your own stash or scraps or a friend’s scraps. Make this quilt your own! Remember: we’re all in this together, and the goal is to learn, expand our repertoire, and get out of our comfort zones along the way. 24-30 Fat 1/8 pieces (11″ x 18″) or 12-15 Fat Quarters should be enough for getting started on the quilt blocks themselves and have yardage for the setting triangles as well for the prints version. (A Layer Cake (collection of 42 10″ squares) may be enough for the blocks, but you will need additional fabric later on for the setting fabrics, sashing etc. If you are going to use solids I would recommend: A bundle of 24 fat 1/8th pieces. (Three shades of red, three shades of orange, three shades of yellow, three shades of warm green (limeish), three shades of cool green(mint, teal), three shades of aqua/turquoise, three shades of royal/denim/navy blue, three shades of purple). The shades of each color would have to be light, medium, and dark with enough contrast that if they are all used in the same block, they would show up as distinct shades. I will share yardage requirements for finishing the quilt as we get closer to finishing the blocks. I’m personally hesitant to pic fabrics for the sashing, borders, etc. until I start seeing the blocks! Do not feel like you need to use the fabrics listed above. If you’ve got stash, use it! If you want to choose your own colors, do it! That’s the whole purpose of this fabric-choosing-post. Make this quilt your own. Use it to stretch yourself, at whatever level you’re at. And most of all, let it be fun – not stressful. Choosing fabric really can be the such a fun part of making a quilt. Don’t become too worried about rules, or collections, or – let it be an expression of your own personality. If you have other tips, or links to great fabric-picking posts, please add them in the comments! Most excellent thought about using a new collection. I like my backing to coordinate with my front so 8 months from now Happy Go Lucky yardage should be starting to show up on Fat Quarter Shop&#39;s sales rack. Absolutely fantastic post. I am always at a loss when it comes to picking fabric. If it doesn&#39;t come in a pre-packaged bundle, I have NO clue if it goes together or not. I had best have someone else pick out and package my fabric for me or I have a slight panic attack as to whether it goes or not. I don&#39;t want my quilt to look utterly ridiculous now do I!! I wish I had words to tell you how much I appreciate your posts on the upcoming quilting bee. It is as if I were attending a class on the matter. So much good information. Thank you very much for all the time and energy you are sharing with us. I am learning a lot!! :o) So much of my quilting is self taught, plus plenty of trial and error! :o) ha! <br />Have a wonderful weekend Amy! I&#39;m really excited about this!! I dont think I&#39;m ready to embark on all solids, so I have decided to create monochromatic blocks each time. Looking forward to watching this quiltventure unfold! It&#39;s wonderful information for a newer quilter. You are a special person. I have many fat quarter bundles but I sure love this Happy Go Lucky line. I think I&#39;ll wait for it by a preorder. Thank you. Have a lovely week end. Great post Amy and so much of what I&#39;ve told the newbies that ask me how to choose fabrics and colors. I always say to start with one or two fabrics that jump out at your and just scream your name. This QAL sounds great and I wish I could join in but since I have 7 deadline quilts to do this spring, I&#39;ll have to sit this one out. I&#39;ll be watching though. You&#39;re welcome. Because I definitely feel that way. Quilting should be about enjoying something, artistic creativity, and personal expression. And more fun than stress. Love all your suggestions for pulling fabics together. I&#39;ve been strictly a &quot;pre-made bundle&quot; quilter but this makes we want to branch out and be more creative. I am really feeling this! I really think i&#39;m going to join in, especially since it&#39;s spanned over many months. I know just the fabric I&#39;m going to use, time to hit up my fabric store! Thanks for getting this together, there is a lot of great informative information. I want to say thank you for your post today. I saw the Happy Go Lucky line and love it, but my husband reminded me that I have a great deal of fabric that I need to use, (and just purchasing a new sewing machine has strapped us a little). So I have a nice fat quarter bundle assortment from Pam Kitty Morning, her first line, that I think will work well. Thank you more than you know. Thanks so much for the great comments and for the encouragement. I&#39;m so excited to see this project unfold and to see all the creative versions of this quilt! I love watching this come together. Great job Amy! Any idea approximately how large this quilt will be finished? I&#39;m sorry if this is answered elsewhere – I took a quick look around and didn&#39;t see anything. I ask as I may want to make extra blocks to make it larger. Thanks! Great question! This quilt is going to be roughly 70&quot; x 70&quot;. I will share more measurements for those who want to make it larger when we get to that point, so for now, yes, make 2 of each block. Thanks! The Quilting Process: Choosing Quality Fabrics – Alice Samuel's Quilt Co.
My wife has been thinking about sewing more, and was curious about how you would choose the fabric for it. 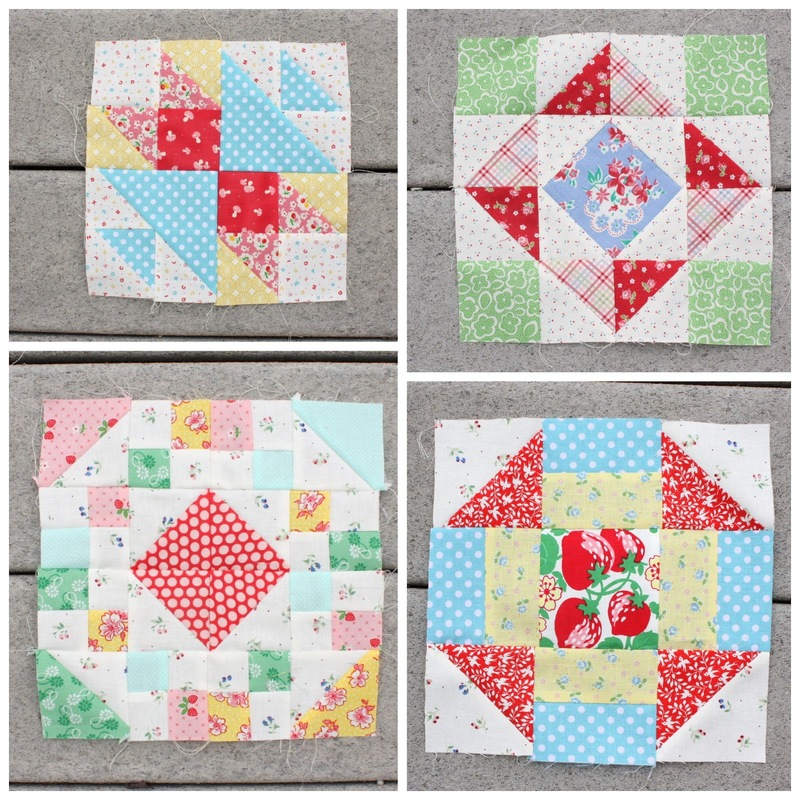 It’s interesting that you say to get a variety of sizes when making something like a quilt. It would be nice for her to be able to choose different patterns that she likes, and have them in different sizes, just in case.